"The median earnings for prime-age (25-64) working men have declined slightly from 1970 to 2010, falling by 4 percent after adjusting for inflation," write economists Michael Greenstone and Adam Looney. Adjusted for inflation, wages for American men are essentially the same as they were in 1970, a phenomenon known as “wage stagnation.” Wages for women have risen since the ’70s, but there are early signs that even their wages are beginning to level off, Greenstone and Looney say. Among the most robust findings in economics is that education reduces unemployment and increases earnings. But even with the remarkable capacity for education to produce growth, the rate of educational attainment in the United States has slowed, especially for men. 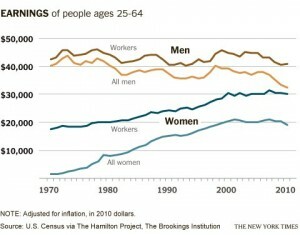 The share of men 25 to 34 with a college degree, for example, has barely increased over the last 30 years. (The trends are much better for women.) The United States, once the world leader in educational attainment, has been surpassed by many countries. Some advocate for more spending on higher education. Others say new academic standards are the key. Still others say we should focus on getting more people through college — a task that could become difficult as the nation’s student debt burden grows. In Indiana, gubernatorial candidates Mike Pence and John Gregg have spent much of the campaign talking about increasing opportunities for career and technical education. “Talking to employers large and small in Indiana, I’ve heard that there are jobs available but they can’t find workers to fill them… It’s what economists call a skills gap in Indiana,” Pence, a Republican, told StateImpact earlier this month. Pence has turned vocational education into a signature campaign issue, saying he would create regional “Indiana Works Councils” to bring together schools with businesses in different regions of the state to create partnerships to benefit students — which will, Pence hopes, lead to job opportunities for students after they graduate. Gregg, a Democrat, says programs supporting students and workers seeking job skills have been the victim of broader cuts to state education funding. “Our job opportunities in this state are in agriculture, advanced manufacturing, logistics, life sciences, energy — all those job opportunities don’t mean anything if we don’t have a well-qualified and educated workforce,” Gregg told StateImpact. 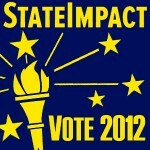 Do you think Gregg’s and Pence’s stances are going to help fill Indiana’s “skills gap”? Or that policies like theirs can help improve stagnant wages?